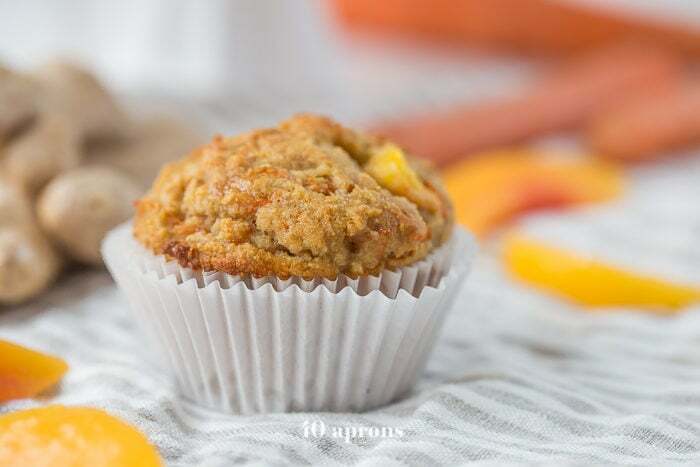 These peach ginger paleo muffins are moist and tender, full of fruity, fresh peaches and earthy ginger. The best thing about these paleo muffins? They don’t taste like they’re paleo! 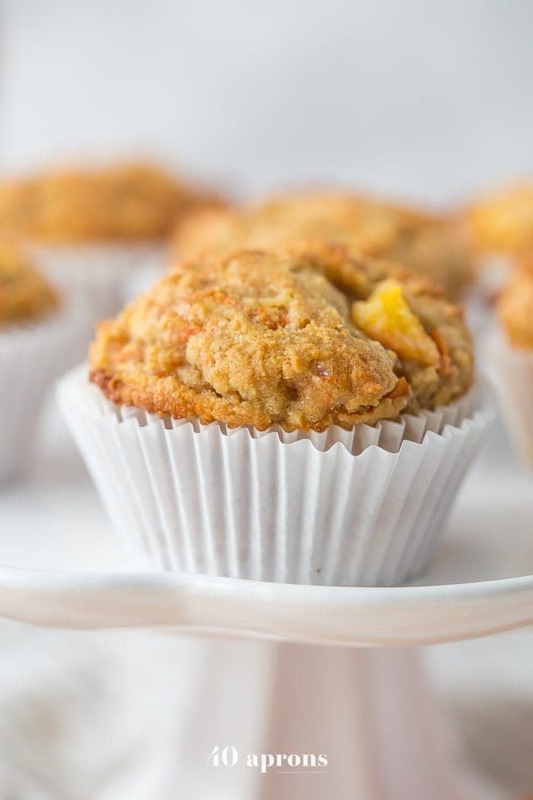 Grain-free, gluten-free, and refined sugar-free, these make an awesome paleo breakfast, too. So, I had three of these for breakfast. I whipped them together furiously, while Leo sat in his little chair, watching some kids movie, spooning globs of yogurt into his mouth and onto his face. “Uh oh! Whoa!” he’d exclaim to me, pointing at the TV. Meanwhile, I’m grating and whisking and stirring and spooning, desperate to make a paleo muffins recipe that doesn’t taste paleo. 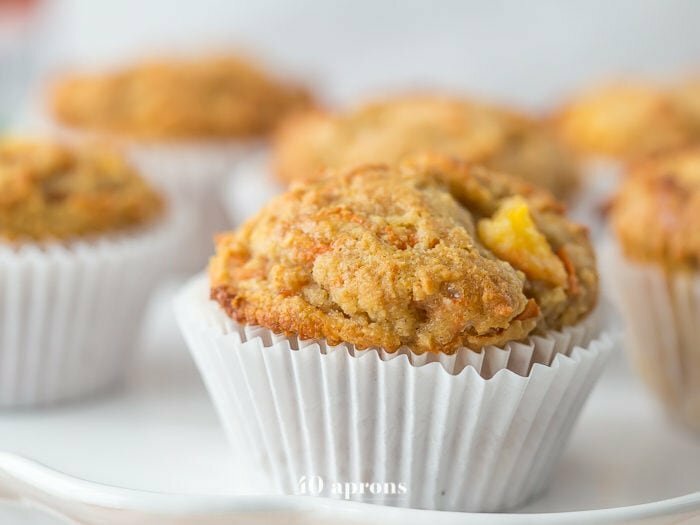 You see… the night before it occurred to me to make peach ginger paleo muffins to celebrate the launch of a very special product to me. 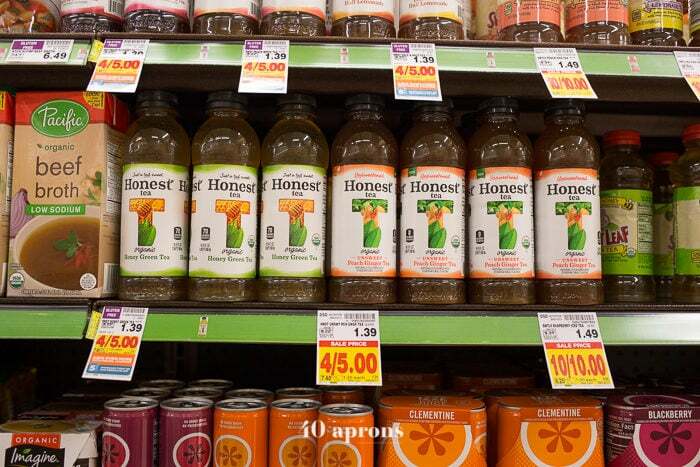 I’ve been a giant fan of Honest® Tea for years, but when they came out with unsweetened Peach Ginger Honest® Tea, I about fainted. 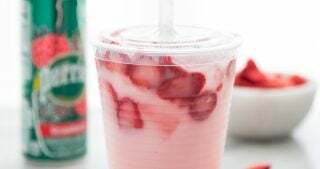 Considering I do regular Whole30s and can’t have any sweetener in my beverages, the news of this product could not have been more welcome. 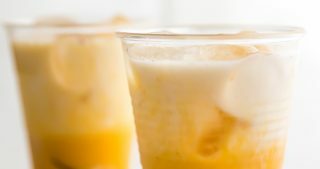 I even posted excitedly about it in our Facebook Whole30 Support Group – a new, super easy Whole30-approved beverage for us! Even better? It’s organic and Fair Trade. Winwinwinwinwin. And I tested a recipe after we came home from dinner, but what came out of the oven was a decidedly paleo muffin. 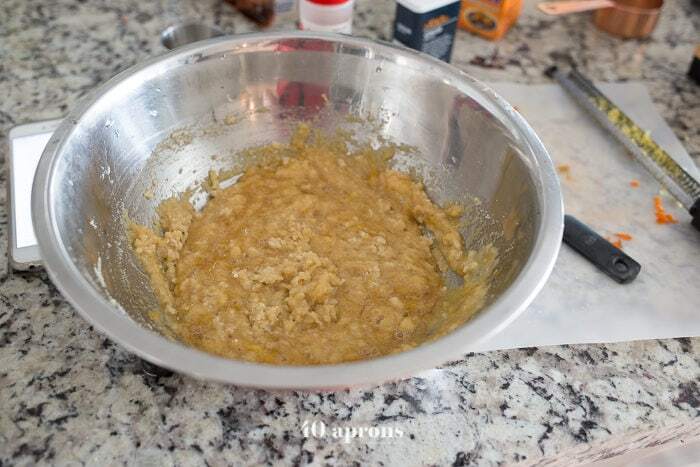 I posted in our Facebook community, The Paleo Group, lamenting how hard paleo baking can be! 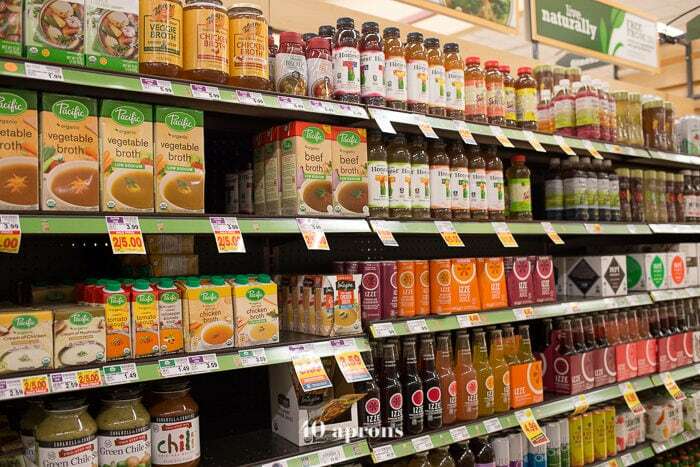 Too often, we end up with healthy-tasting treats, which aren’t… really treats at all, are they? Grainy or dry, I just can’t bring myself to waste the $23 in almond meal on anything less than truly delish paleo baking. So there was a lot riding on that Peach Ginger Paleo Muffins 2.0 recipe that morning, as Leo sat babbling away next to me in the kitchen. But what resulted was 1000% worth the effort and, let’s face it, heartbreak of the paleo muffins failure that preceded this batch. So tender, so moist, and so full of flavor, I devoured three of them for breakfast. I broke off a piece of my initial test muffin and handed it to Leo. He shoved the bite into his mouth, chewed thoughtfully for a moment, then immediately demanded More. More. More! And Leo is, of course, my most honest taste tester. The best compliment these muffins can possibly get? They don’t taste paleo. Let that sink in for a moment… they’re grain-free, dairy-free, and refined-sugar-free, but they taste like something you’d get at a bakery. What. 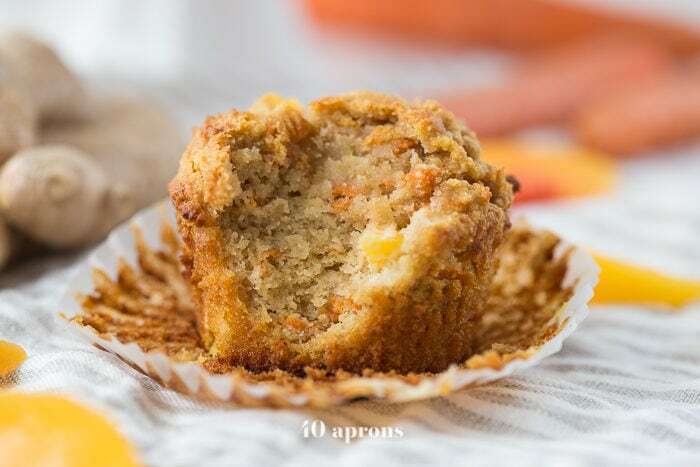 These muffins start with a fantastic carrot muffin base, adapted from Texanerin. 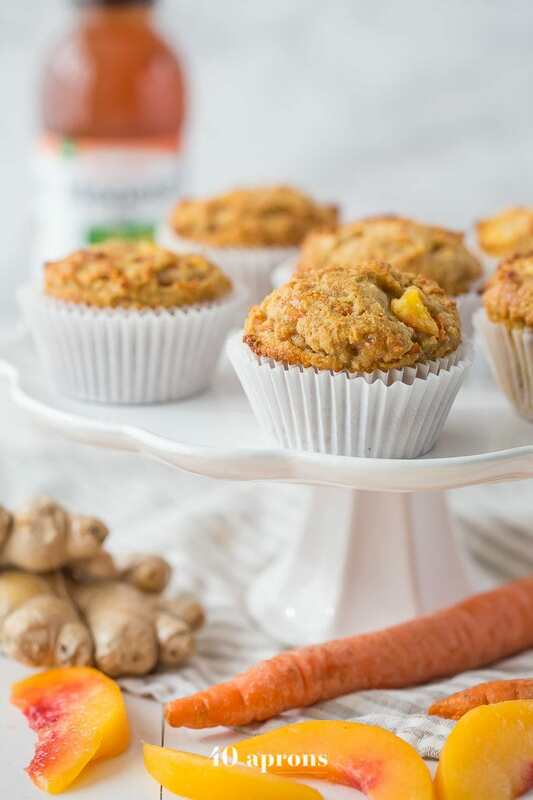 I wanted the moistness from the carrots and to add a bit of veggie goodness, making them even better for breakfast! 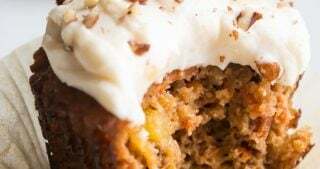 The honey adds a delicate sweetness – not too sweet at all – and the coconut oil makes sure they have a wonderful texture. 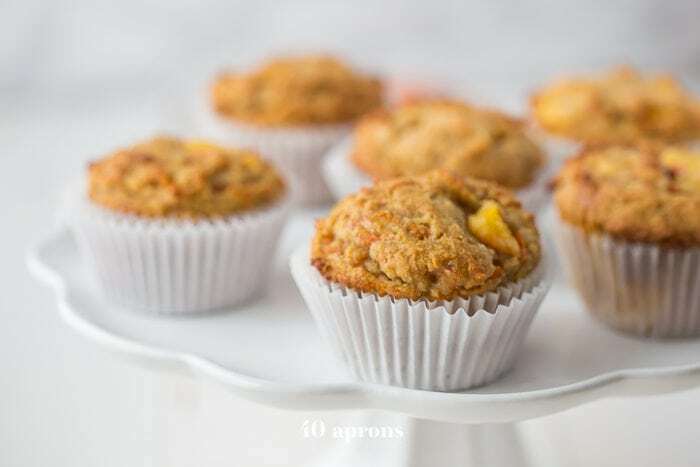 I folded in diced, fresh peaches for welcome pops of juicy, spring flavor, and paired the fruit with fresh and dried ginger to ground the whole recipe and offer a little something different than the average peach muffin. 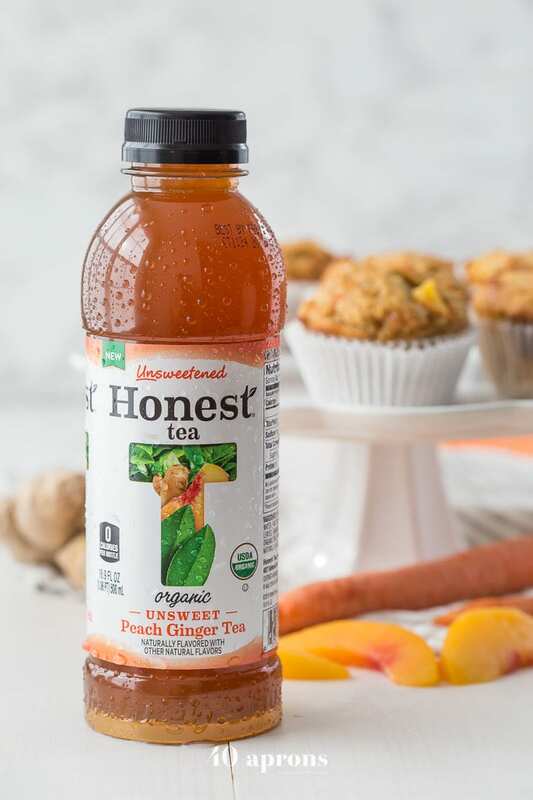 Inspired by the new unsweetened Peach Ginger Honest® Tea, they’re an easy recipe that make a perfect breakfast or snack. They’re super easy, too. Don’t believe me? Check it out! 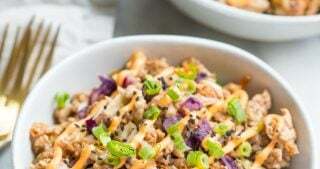 Whisk together your dry ingredients in one bowl, and your wet in another. Combine wet and dry and stir ’til no lumps remain. 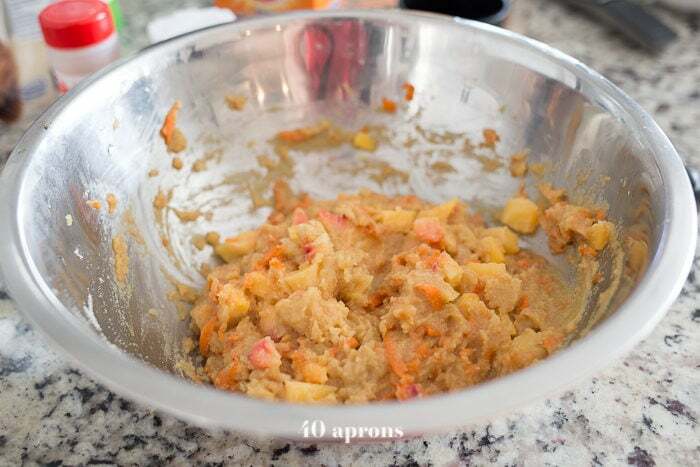 Fold in the grated carrots and diced peaches. Spoon into a lined muffin tray. I filled them to the top for a nice, bakery-style dome. Bake 20-27 minutes then let cool 5 minutes in the pan. Transfer to a wire baking rack to completely cool. Get inspired by other fabulous bloggers’ unsweet Peach Ginger Honest® Tea recipes and DIY tutorials by clicking here. Preheat the oven to 350°. Line a muffin tin with 10 muffin liners. 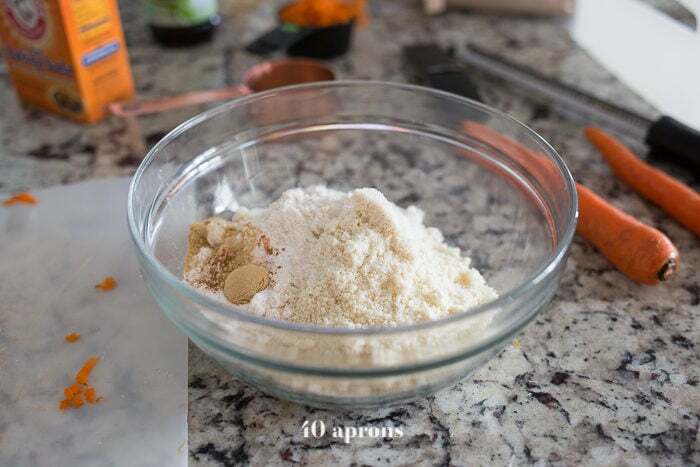 In a medium bowl, whisk together the dry ingredients: almond flour, coconut flour, baking soda, salt, pinch cinnamon, and ground ginger. 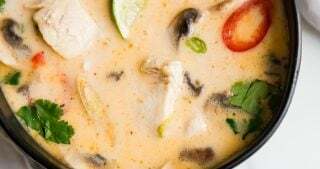 In a large bowl, whisk together the wet ingredients: eggs, coconut oil, honey, and vanilla extract. Add the dry mixture to the wet mixture and whisk until no lumps remain. 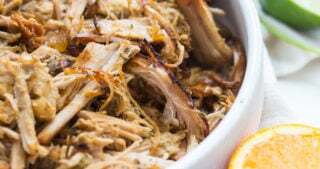 Gently fold in the grated carrots and diced peaches. 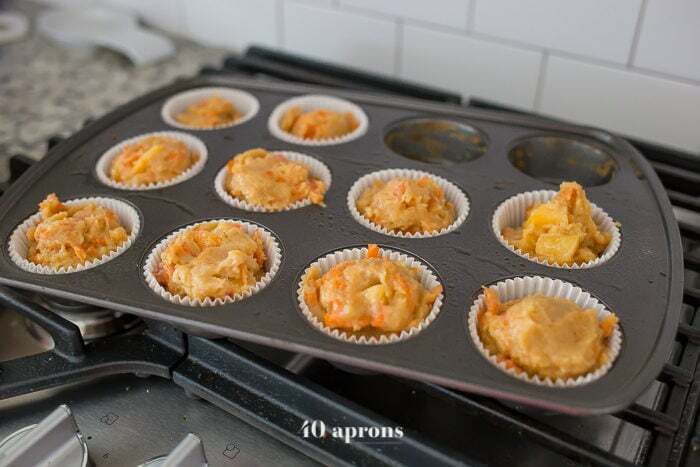 Scoop into prepared muffin tins, filling almost completely full. They will rise, but they will create lovely domed tops. Bake 20-27 minutes or until a toothpick inserted in the middle comes out clean. My smaller muffins took about 20 minutes to bake, while my larger, bakery-style muffins took more like 27. Let cool 5 minutes in the pan then transfer to a wire rack to cool completely. These look amazing! Can you eat them while on a Whole30? These muffins are wonderful!! I make them all the time…sometimes I use frozen mango instead of peaches. Oooh what a genius substitution! I’ll have to try that. I’m so glad you like these as much as we do! I came across your recipe on Pinterest as I was searching to make some healthy muffins for my husband. The title caught me because it just sounds so yummy and lo and behold I just happen to have all these ingredients on hand! I got right to work and these came out AMAZING. I love love love them, thank you for creating this recipe. I’m so glad you liked them! And I do think you’d love a Whole30 🙂 Thank you so much for your comment! The recipe calls for 1/2 tsp dry ginger and 1 tsp fresh ginger. Is that suppose to be one or the other? 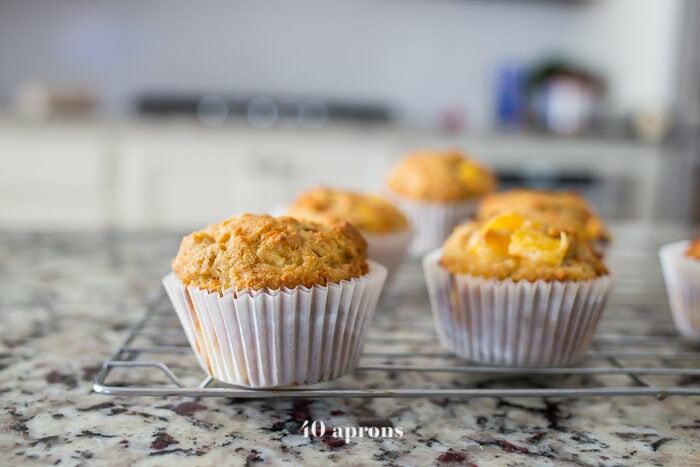 Just wanted you to know I only got 7 muffins from the recipe – I thought all muffin tins were a standard size? They just came out of the oven so I haven’t tasted one yet but they smell divine! Huh! I wonder why that is. I do believe most muffin tins are the same size, but you might have a “bakery muffin” size? How high did you dome the batter? When I did a Whole30 in February, it changed my life too. I never thought I would say that but it did. I do occasionally splurge, especially in the summer, but 90-95 % of the time I eat Whole30 with some Paleo dishes mixed in. Our bodies are so powerful and should be treated well. These look awesome–can’t wait to try! 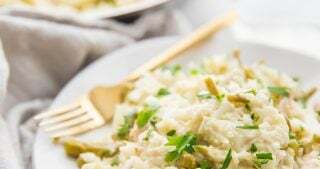 Do you happen to have the nutritional breakdown, i.e., carb count? Thank you! Hurray for a win! They certainly look delicious!! where is the actual list of ingredients and recipe? Thanks!! Sorry – we had a plugin problem! 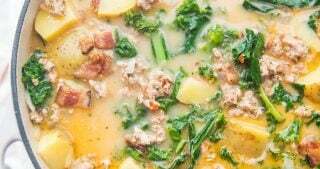 The recipe is back 🙂 Thanks, Sheila, and sorry for the inconvenience! OMG Cheryl. 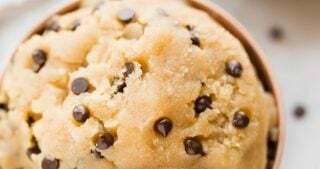 I wish I could enjoy one of these right now because they look AMAZING. 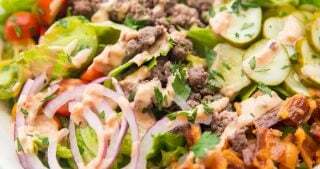 After Whole30, I’m making them for sure!